Several major tobacco firms have lost a second appeal against a ruling forcing them to adopt plain packaging. British American Tobacco, Imperial, Japan Tobacco International, and Philip Morris had challenged the legislation which has been in force since May. It requires all tobacco packaging to be uniformly olive green and with large images intended to act as health warnings. But the firms had called the rules "disproportionate". They initially challenged the rules in the High Court in May but lost the case, with Judge Justice Green calling the legislation "valid and lawful in all respects". The cigarette companies then took their case to the Court of Appeal, but on Wednesday three judges in London rejected their challenge against the High Court's decision. Public Health and Innovation Minister Nicola Blackwood told the BBC: "We are pleased that this decision will help many people to lead longer and healthier lives." But a British American Tobacco (BAT) spokesperson said it did "not necessarily" mark the end of the challenge and that it was considering its options. The government introduced The Standardised Packaging of Tobacco Products Act in May, claiming it would allow a generation would "grow up smoke-free". 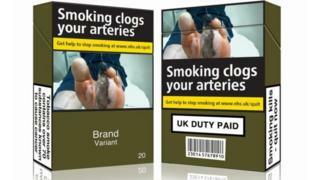 The legislation not only requires packaging to be uniform but also feature graphic picture health warnings covering 65% of the front and back of every packet of cigarettes. Additional warnings must feature on the top of packs, too. But the tobacco firms argued the rules would destroy valuable intellectual property rights and render products indistinguishable. They challenged the legislation on a number of grounds, including claims that they violated UK and EU laws, and were "disproportionate" and "must be quashed". Commenting on today's Court of Appeal ruling, a BAT spokesperson said: "Despite today's decision, we remain firm in our belief that plain packaging is an ineffective policy that doesn't work to reduce smoking levels." "These are issues of significant constitutional and commercial importance which, if left unchallenged, would have serious implications for other legitimate businesses and for the ability of the government to act first and justify later when it comes to regulation," they added. Japan Tobacco International said it disagreed with the decision, saying: "This commercial vandalism sets a dangerous precedent for other targeted industries, who must be concerned that their brands will now be under threat. We are considering an appeal to the Supreme Court." But Deborah Arnott, chief executive of health charity Ash, called the decision a "victory for public health and another crushing defeat for the tobacco industry". "This ruling should also encourage other countries to press ahead with standardised packaging, now that the industry's arguments have yet again been shown to be without foundation," she said. The EU's Tobacco Products Directive also came into effect in May, setting out other rules such as banning packs of 10 cigarettes. That month, the European Court of Justice ruled that the directive, which had been held up by legal challenges ever since it was adopted in 2014, was lawful.